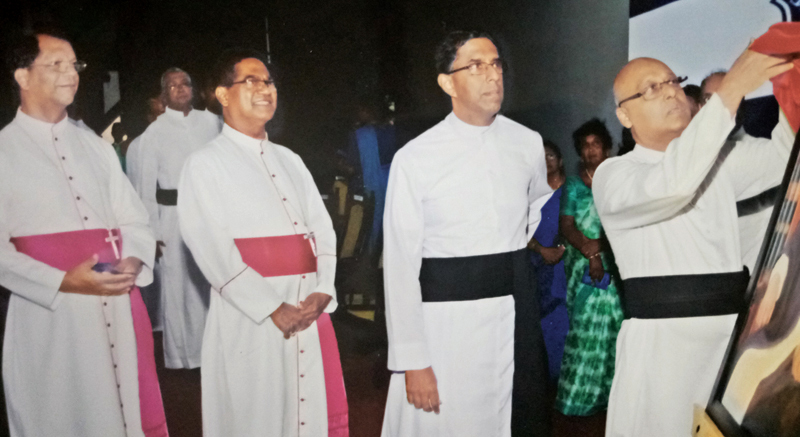 St. Joseph’s College, Colombo 10, recently held a ceremony to bid farewell to Rev. Fr. Travis Gabriel who served as rector for five years and prior to that, as teacher for 24 years. Here, Auxiliary Bishops of Colombo Rt. Rev. Dr. Maxwell Silva and Rt. Rev. Dr. Anthony Jayakody and Vice Rector Rev. Fr. Ranjith look on, as the outgoing Rector unveils his portrait, at the farewell ceremony held at the college. Picture by Joseph Pius, Wattala Special Corr.